The Adirondack Park was created in 1892 and established as "Forever Wild" in 1894. However, in the pre-1960s, environmental conservation and preservation weren't high on the list of issues addressed by political platforms. In New York, that all changed when Henry Diamond helped renew the focus on the environment, and he eventually shaped the modern day Department of Environmental Conservation (DEC). Henry Diamond was born in Chattanooga, Tennessee in 1932. He earned his B.A. degree from Vanderbilt University in 1954, where he was elected the outstanding undergraduate. After college, Diamond served the U.S. army in Germany and received a Freedoms Foundation award. He returned to college soon after his military service, and he graduated from Georgetown Law Center in 1959. After graduating from law school, Henry Diamond dreamed of working for the President of the United States. He initially considered joining John F. Kennedy's Presidential campaign, but he ultimately decided that New York's governor, Nelson Rockefeller, had a greater chance in the 1960 election. Diamond's career took a turn when he was introduced to Nelson Rockefeller's brother, Laurance Rockefeller, the new chair of the Outdoor Recreation Resources Review Commission (ORRRC), and a prominent conservationist. Henry Diamond's meeting with Laurance Rockefeller set in motion his career in nature conservation and preservation. Starting in the 1960s, Diamond partnered with Laurance Rockefeller on environmental issues and advised Governor Nelson Rockefeller. One of Diamond's earliest contributions was his work on the ORRRC's report. The ORRRC was developed by Congress in 1958 to study the country's outdoor recreation needs. Laurance Rockefeller hired Diamond to work with the ORRRC and edit the committee's 27-volume report. Diamond spent three years working on this report, and it resulted in the creation of landmark pieces of legislation. Indeed, the report is regarded as setting the foundation for the Land and Water Conservation Fund, the National System of Rivers and Trails, and the Wilderness Act. From 1963-1969, Diamond's environmental career flourished. Along with his work for the ORRRC, Diamond served on multiple environmental groups, such as the Long Island State Park Commission, the Commission on the Future of the Adirondacks, and the Commission on the Future of the Hudson River Valley. Both Nelson and Laurance Rockefeller were involved in the development of Henry Diamond's career. As a testament to Diamond's influential role in environmental issues, Nelson Rockefeller appointed him the Department of Environmental Conservation's first commissioner on the first Earth Day in 1970. The DEC was created out of a need for leadership to address nationwide concerns over air and water pollution. Before the DEC existed, the agencies that worked to protect the environment weren't unified and had different functions. In his new role as DEC commissioner, Diamond helped shape the version of the DEC that operates today. Diamond brought together people from the Health Department, the Parks Department, as well as the old Conservation Department, and he used them to develop new programs. Through these agencies, the DEC addressed issues of mercury pollution, water and air pollution, public land and forest access, and many others. This union would become the model for departments in other states. One of the highlights of Diamond's career as DEC commissioner was when he took a 533-mile bicycle ride across the state to promote a $1.2 billion bond act. 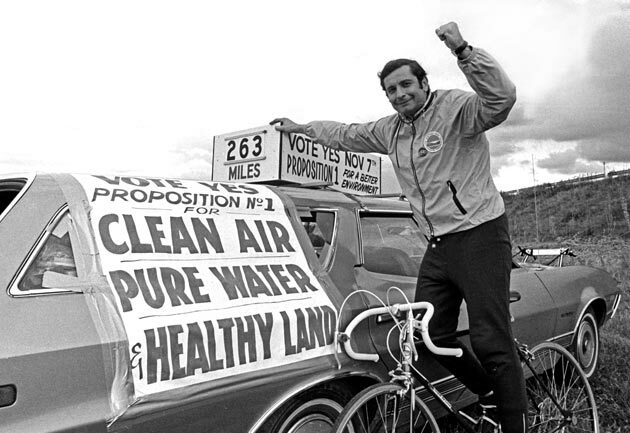 The bond act later passed, and it provided funding for water and air pollution programs and land acquisition. Although Diamond is famous for his role as the DEC's first commissioner, he was also a hugely influential figure in the Adirondacks. As a member of Nelson Rockefeller's Commission on the Future of the Adirondacks, he worked on controlling the amount of development in the Adirondack Park. To further this initiative, the Rockefellers formed the Adirondack Park Agency (APA) in 1972. Since the APA planned to institute new rules on land development in the Adirondacks, the reaction to the agency was mixed. Before the APA could set new rules, many developers tried to move forward with their projects. Of note, a large resort was proposed by Ton-De-Lay Associates, which would involve building on 18,400 acres in Tupper Lake. Henry Diamond, as DEC commissioner, refused the developer's water and septic system permits, citing negative environmental impact. This decision was upheld in court and set a precedent for a new state law requiring environmental impact reviews. Diamond resigned from his DEC commissioner position in 1973 and became chairman of President Nixon's Advisory Committee on Environmental Quality. In 1975, he joined a Washington law firm and continued his work in environmental law. Later on, in 1986, he was a founding director of the Rails-to-Trails Conservancy. Diamond also co-authored, with Patrick Noonan, Land Use in America, The Report of the Sustainable Use of Land Projects (1996). Until his passing in 2016, he provided advice to clients on environmental and land use issues. His life was reflected on in a DEC press release, "For more than 60 years he devoted his life to public service and protecting our natural resources with a focus on leading by example. It's clear that New Yorkers and the environment are better off because of his efforts, and when the history of New York State environmentalism is written, the name Henry Diamond should be at the forefront."